Rev. Cathy C. Jones is the third of four children born to Mary Stone Cross and the late Cecil Cross, Sr. born and educated in Chatham County, North Carolina where she was in the first graduating class of Northwood High School in Pittsboro, North Carolina. She continued her education at Central Carolina Community College in Sanford, NC, Wake Technical Community College in Raleigh, NC, and the Bishop’s School of Ministry in Gastonia, NC. She has also attended The Raleigh Institute of Biblical Studies in Raleigh, NC. She obtained her Associates, Bachelors and Masters Degrees from Justice Fellowship International Bible College in Raleigh, NC. On May 21, 2010 she was conferred her Doctorate in Biblical Studies from Justice Fellowship Bible College in Jacksonville, North Carolina. In May of 2016 she was conferred an Honorary Doctorate in Divinity from the Apex School of Theology in Durham, North Carolina. Rev. Jones was ordained a Local Deacon in 1991, a Traveling Elder in 1992, and admitted into Full Connection in the Christian Methodist Episcopal Church in 1995. She served as pastor of Prince Chapel CME Church in New Hill, NC for 18 years where many souls were saved and lives were transformed for kingdom building. While there, the accomplishments were great. While there she served in serval capacities in the community with the area churches. She served as President of the Interdenominational Ministerial Alliance for 3 years. Rev. Jones currently serves as the humble but proud pastor of Parkwood Institutional CME Church, Charlotte, NC where the Spirit of the Lord is transforming lives and illuminating hearts. In the Hidden Valley Community where the church is located, we are investing time in activities that will draw the community to Jesus our Savior. She continues to spread God’s Word by her preaching and teaching throughout North Carolina and other states. On December 1, 2011 she offered the prayer for the opening session of the House of Representatives in Washington, DC. Through the years she has been the recipient of various honors as a result of her spiritual gifts. 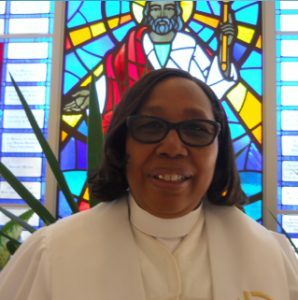 In January of 2014 she was presented an award at the CME’s Annual Pastor’s Conference for her accomplishments and pastoral leadership in the Seventh Episcopal District as one of the outstanding Pastors. She also currently serves as the Dean of the Local Preachers for the Durham District of the Carolina Region of the CME Church under the leadership of Presiding Elder Clifton Harris, Jr., Chairperson of the Committee on Ministerial Examination of the Carolina Region of the Seventh Episcopal District of the CME Church under the leadership of Bishop James B. Walker and was appointed by Bishop Walker as the Seventh Episcopal District Representative of the Commission on The Concerns of Women Ministry for the CME Connectional Church under the leadership of Senior Bishop L.L. Reddick, III. She has been married to Mr. Theodore Jones for 36 years and this union has been blessed with seven children, 1 son-in-law, 5 daughters-in-law, 19 grandchildren and 11 great-grandchildren. She is a firm believer that all things work together for good to them that love God, to those who are the called according to his purpose!